After a concerted effort to “closely examine five years of State Department diplomatic cables from 2005 to 2009 to provide the first comprehensive analysis of the strategy, tactics and U.S. foreign policy objectives to foist pro-agricultural biotechnology policies worldwide,” nonprofit consumer protection group Food & Water Watch published on Tuesday a report showing in plain detail the depth of the partnership between the federal government and a number of controversial biotech companies that have slowly but surely pushed their GMO products on a number of new countries in recent years. 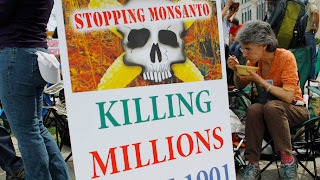 At center stage in the report is Monsanto, the St. Louis, Missouri-based makers of genetically-modified crops and genetically-engineered seeds that has continuously generated criticism as of late over its practices both on the growing field and in a court of law. 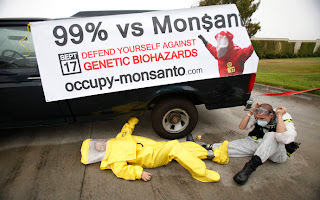 Monsanto is among the most valuable corporations in the US, yet has relentlessly sued small-time farmers across the world over alleged patent violations, often forcing independent agriculturists to go out of business. Legislation signed into law last month provided litigation immunity to GMO companies including Monsanto, and on Monday the Supreme Court sided with the corporation when ruling on a landmark patent infringement case. When reached for comment by Reuters, Monsanto spokesman Tom Helscher said, “We remain committed to sharing information so that individuals can better understand our business and our commitments to support farmers throughout the world as they work to meet the agriculture demands of our world's growing population.” The State Department did not immediately respond to requests for comment. As RT reported previously, that so-called “Monsanto Protection Act” signed into law last month was co-authored by a senator that has received thousands of dollars in campaign contributions from the company — a revelation that didn’t surprise many given that another important figure in Washington, Justice Clarence Thomas, served as an attorney for the corporation before he was nominated to the high court only to eventually preside over a case involving his former employer. 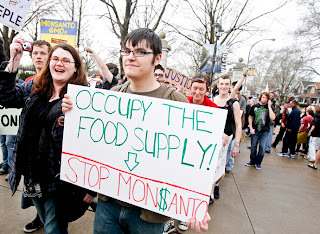 But according to Food & Water Watch, the relationship between Monsanto and the government extends beyond Congress and the Supreme Court. This week’s report comes just one day after Justice Thomas and the Supreme Court sided with Monsanto in reaching a decision in a landmark patent suit. In the case, the high court said that an Indiana farmer infringed on Monsanto’s patent rights by using specially-made seeds he obtained second-hand without signing a contract with the company. That ruling, however, came just days after the company was hit with comparably bad news: on Friday, the US Department of Agriculture ordered an extra round of tests for new GMO breeds being developed by Monsanto and Dow, putting on hold plans to release to the public laboratory-made crops that can withstand heavy dousing of dangerous pesticides. Both companies want to make available crops that are resistant to the chemicals 2,4-D and dicamba, a move that environmentalists fear will prompt farmers to use more of these toxins. 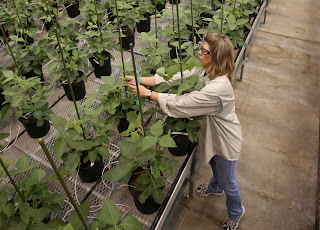 “The danger that 2,4-D and dicamba pose is a real threat to crops…nearly every food crop,” Steve Smith, director of agriculture at Red Gold, told Reuters last year.